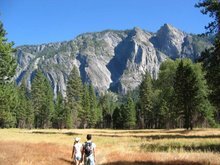 I am trying to blog regularly, so I decided to make this comment a trackback instead of a comment to the post. Jerome was highlighting some of his recent triumphs with coupons. Coupons can be pretty great, although the one time my 'no purchase necessary' coupon was rejected at Ralph's has left me with slight fear of coupon rejection. I had gotten this 'Free box of any Kashi product under $4.50' for filling out an online questionnaire and sharing my very valuable opinions about whether I thought 'cheese and pimento' crackers sounded more appealing that 'sun-dried tomato and pepper' (these flavors just now made up on the spot). Anyway, my checkout guy refused to take the coupon, perhaps because it looked as though I had printed it out from my computer, despite the fact that the coupon was supposed to have some sort of code thing to verify its value. Oh well. Alex and I went bowling last night at AMF Mar Vista and for 2 - $4 games we got 2 buy-one-game-get-one-free coupons. This is awesome because I think it will help our goal to bowl more frequently. We also bought bowling shoes to help with the process. Neither of us have ever owned bowling shoes. At $50 each (Zappos.com, price includes shipping) it will take us slightly over 11x bowling to recoup the cost. Barring traumatic injury or early death, I think it's doable. If we expect to live 60 more years, that would mean bowling at least once every 5.4 years. Although this is assuming that we'll both be able to bowl in our 80s. Maybe by then we'll break 100 regularly. Finally, the other thing that is coupon-like but not exactly a coupon -- rebates. Rebates can seem like a good deal, but these days I'll only buy something w/a rebate if I would be willing to buy it anyway (w/o rebate), since the money often doesn't come back. I've never tried to hunt unreturned rebates down, but I've been burned too many times. 4. put oil on low heat until pasta is cooked. drain pasta. 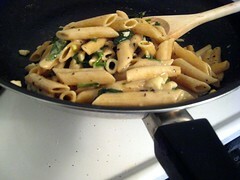 8. toss pasta in oil and spinach, adding a small amount (1/2 a pat) of butter for taste. add kosher salt and coarsely ground black pepper to taste as well. I thought it was going to be much more disgusting-looking, based on my peek into the top of the bread machine before the bread was done. All I saw was a dark bluish-green color, reminiscent of inappropriately mixed play-dough, dirty water in which one rinses watercolored brushes, and creatures from the swamp. I guess that's what you get, since yellow + blue makes green. We had a couple of overly ripe bananas, so I thought I'd give banana bread a try. Alex even had a recipe written down for some already. But of course, I can never leave well enough alone. I cut back on sugar and added blueberries to the mix. 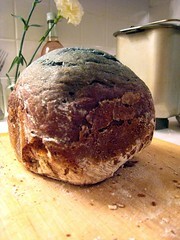 The coloring wasn't uniform and the bottom was caked with flour because I didn't know how to use the bread machine. The batter probably could have been stirred a bit before starting the machine. Also, according to our resident bread machine expert, it helps to put the liquid ingredients in first. In preparation for my campus visit last week, I upgraded elements of my wardrobe. So far I am very satisfied with the expenses incurred. 1. Pant suit set (obtained during Ann Taylor's suit sale) -- quality and classic. I do so much shopping online these days that I was very tempted to get an outfit online. But I did go to the mall, and I was pleased. 2. No-show trouser socks from Target. Pleased, although they are so thin that I'm not sure how they will fare in the washer+dryer. I felt it was necessary to get some socks because even I know better than to match the dark pant suit with my white athletic socks. 3. Black loafers from EasySpirit. I am especially happy about how well these shoes worked out, since I have been the victim of lovely but uncomfortable/painful/torturous (depending how long they are worn) shoes many times before. As soon as I considered getting interview shoes, I decided that they should be appropriate but comfortable. I wanted to be comfortable, and it was likely that I'd have to do some walking on the campus. I was tempted to try the whole athletic shoes with suit thing, but decided that professional basketball players are the only ones who can get away with that. So for comfortable shoes I headed to EasySpirit. Because even their store name seems comforting. Although I had never purchased shoes there, it seemed like the right thing to do at the time. I browsed their selection carefully before trying on a couple pairs. I was in the store for 20 minutes or so. During that time, several people and couples came into and left from the store. Not one of them appeared to be under the age of 50, which caused me to question whether it was okay for me to buy EasySpirit shoes. But they were comfortable. So I did. And they are still comfortable. I think those older folks are trying to keep this secret for themselves. My first time using the cast iron skillet in the oven. I was pleased. No measurements, because I'm lazy like that. 2) Chop head of cauliflower into florets. 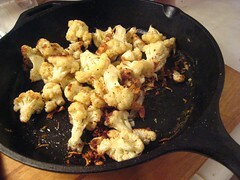 3) Mince 2 cloves of garlic and toss with cauliflower and extra virigin olive oil. 4) Season with garlic salt, oregano, coarse black pepper, nutmet. 5) Sprinkle with shredded romano. 6) Pop skillet into the oven for 30 min, agitating contents every 10. I reduced heat to 325, maybe halfway through. We tried to watch Numb3rs. We really wanted to like it. 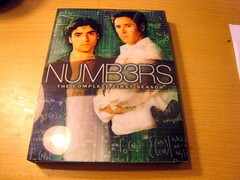 Unfortunately, watching episodes eventually became an obligation, and I found myself saying things like, "We should watch Numb3rs". A couple episodes were decent, and Alex liked talking about the mathematical aspects that he understood, but this box is probably going back to eBay unfinished. Props to the actors in the show, who made the experience more worthwhile. 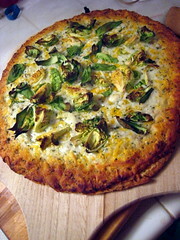 We don't have kids, but I suspect that most kids (or adults, for that matter) will eat pretty much anything you put on pizza. - tofu and other non-meat things, maybe veggie burger patties, quorn "meatballs"